Lexington, Ky. – May 15, 2016 – The Kentucky Spring Horse Show wrapped up on Sunday in the Rolex Stadium with the featured national classes: the $25,000 Under 25 Grand Prix followed by the $50,000 Commonwealth Grand Prix. Kristen Vanderveen and Bull Run’s Eternal outpaced a 15-horse jump-off to grab the win in the $50,000 Commonwealth Grand Prix, presented by Audi of Lexington, which also counted towards valuable points earned in the Rolex/USEF Show Jumping Ranking List. After consistently producing clear rounds all week, Vanderveen and Bull Run Jumpers’ Bull Run’s Eternal proved to be a force to be reckoned with after beating Aaron Vale and Carlo’s early jump-off lead of 42.001 seconds by three full seconds. 47 exhibitors navigated the Bernardo Costa Cabral-designed first round course, consisting of 13 obstacles, which challenged riders with a double and triple combination, a triple bar fence and multiple tight rollbacks in a time allowed of 81 seconds. The jump-off revealed a seven-fence serpentine with many large oxers that resulted in faults for five of the 15 second round challengers. Vanderveen and the 12-year-old Belgian Warmblood gelding were third in the jump-off order-of-go and broke the beam in 39.091 seconds, which set the pace for the rest of the 12 horse and rider combinations that would prove to be unbeatable. It did not look like anyone would come close to Vanderveen’s time until five rounds later when Andrew Ramsay and Cocq A Doodle, owned by The Doodle Group, entered the ring. They raced around the shortened track to catch Vanderveen’s time but only made it within 9/10th of a second, after laying down a solid double-clear effort, finishing in 39.942 seconds and taking second place honors. Even as the second to last jump-off contenders were unable to catch Vanderveen’s time, she had already secured her win for the class by returning to the ring as the last entry to go in the jump-off round on her second mount, Bull Run’s Holy Smokes. Rounding out the top three in the Sunday finale of the Kentucky Spring Horse Show was Ramiro Quintana and Whitney, owned by St. Bride’s Farm. They tripped the timers in 40.215 seconds. After a successful finish to the Kentucky Spring Horse Show, Vanderveen will be returning to Tryon next week to train clients, but always enjoys visiting and competing at the Kentucky Horse Shows. “After this week, I think I should never leave Kentucky,” laughed Vanderveen. “I jumped clean in every single FEI class – it just hasn’t come to a win until today. 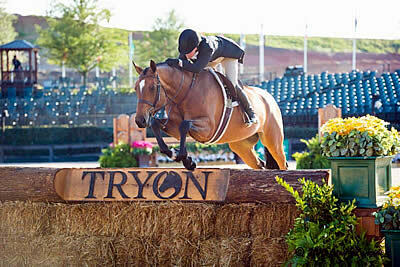 I’m going back to Tryon next week. I have all of my clients in Tryon and they got this week off, so I’ll be back to help train them. Earlier in the day, the Under 25 Grand Prix was held in the Rolex Stadium and the blue ribbon went to Noel Fauntleroy and her own Cabras, who bested a starting field of 26 and a jump-off field of 13. Fauntleroy and the 12-year-old Holsteiner mare were among six to produce double-clear rounds, finishing the fastest by one second in 30.003 seconds. Eve Jobs and her own Sandor De La Pomme were close behind Fauntleroy stopping the timers in 31.242 seconds to take second place, while Hunter Holloway and VDL Bravo S, owned by Hays Investment Corp., took the third place spot finishing in 32.489 seconds. Having shown in the U25 series multiple times, Fauntleroy really appreciates the bridge the series provides for young riders to develop experience at competing their horses on an international level. In addition, Fauntleroy shared similar sentiments as Vanderveen in regards to competing at the Kentucky Horse Shows. 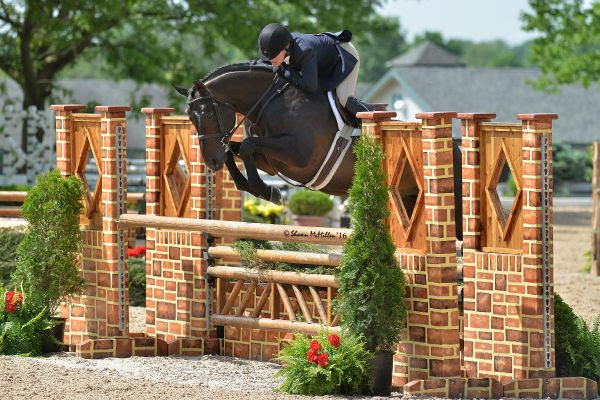 Sunday was ‘Derby Day’ in the Claiborne Ring at the Kentucky Spring Horse Show with the $15,000 USHJA International Hunter Derby as well as the $5,000 Hallway Feeds USHJA National Hunter Derby. The International Hunter Derby was dominated by Kelley Farmer who took the top two spots on Baltimore and Point Being and had a total of five horses in the class. The third spot went to Peter Wylde and Quax. Farmer and Baltimore excelled in the handy, pulling in scores of 89 and 90 from the judges. Adding on four points for taking the high options, and seven and five handy points, respectively, bringing their total score to 388. She was full of praise for Baltimore’s performance in the handy round. Farmer also impressed the judges on Point Being bringing in a score of 369 and taking all of the high options in both rounds. Peter Wylde and Quax were right behind her in third place with a score of 368.5. Earlier in the day, Geoffery Hesslink excelled in the $5,000 Hallway Feeds USHJA National Hunter Derby winning aboard Rookie, an 8-year-old Warmblood gelding, and taking third place with Esco. Douglas Boyd took second place with Calido’s Son. The $5,000 Hallway Feeds USHJA National Hunter Derby is part of the $40,0000 Hallway Feeds USHJA National Hunter Derby series which is returning for the fifth year in a row at the Kentucky Horse Park. The five-part series awards a $15,000 Hallway Feeds Leading Rider Bonus presented at the conclusion of the series. Douglas Boyd and Calido’s Son were right behind Hesslink in second place with a score of 178. Hesslink rounded out the top three with a score of 176 aboard his second mount Esco. The Kentucky Spring Classic will continue May 18-22 with the $5,000 Hallway Feeds USHJA National Hunter Derby in the Stonelea Ring on Saturday, May 21. 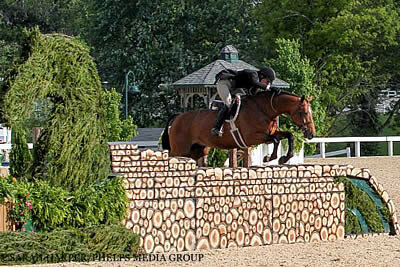 The Kentucky Spring Classic will also offer WIHS and NAL qualifiers plus $10,000 Show Jumping Hall of Fame Classics. (C) ESI PHOTOGRAPHY. Kelley Farmer and Baltimore. Thermal, CA (March 22, 2016): As the sun set over the mountain ridge at HITS Desert Horse Park in Thermal, California, an eager crowd gathered to witness thirty-nine riders and their elegant mounts compete for one of the most prestigious hunter victories, the $100,000 USHJA International Hunter Derby. Kelley Farmer returned to HITS Thermal with several horses to compete in the Derby in Week VIII of the Desert Circuit, one of three $100,000 International Derby classes being offered by HITS this year. 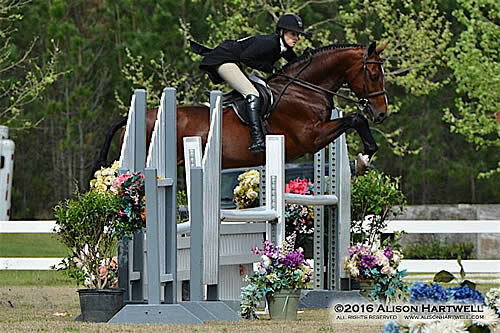 After garnering all top three spots in the Derby at the HITS Ocala Masters just a few short weeks ago, the Keswick, Virginia equestrian once again took claim to first, second and third in Thermal. Farmer garnered the win with Baltimore, owned by Jane Gaston, who herself is an accomplished amateur hunter rider. Baltimore was Farmer’s second place mount of the Derby at the HITS Ocala Masters. At Thermal, Farmer also placed second with Publicized, owned by Amanda Hone, and third place with Kensel, LLC’s Mindful, the winner of the Derby at the HITS Ocala Masters. 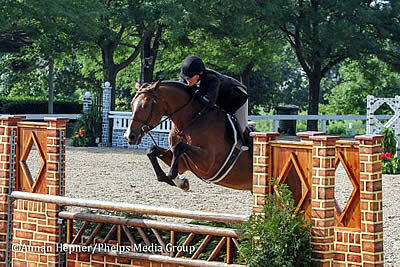 Rian Beals of Saugerties, New York set a beautiful course in the HITS Grand Prix stadium with 13 all natural-type hunter jumps elegantly decorated. An extra-long natural tree jump across the middle of the ring, which horses jumped beautifully, was an eye-catcher and spectator and rider favorite. Larry Glefke, the trainer of all three winning mounts, said the course “was one of the best Derby courses we have seen” this year. The top twelve returned for the second round of the two round derby. First to return was Hugh Mutch of Redwood City, California riding Bunistar, owned by Naomi Rubin. Mutch, a top West Coast Grand Prix and hunter rider, laid down a beautifully executed handy round, taking a short, flowing track and all high fence options for the top second round score of 299. As one judge commented, “Bert gave riders and spectators a riding lesson tonight.” Mutch topped all other eleven riders in the handy round bringing himself from twelfth place after round one to fifth in the final standings. Nick Haness of San Clemente, California and Spot On, owned by West Coast Equine Partners, LLC, challenged the top contenders. Haness opted for three of the height options to capture a second round score of 290. With a total score of 557.5 for both rounds, Haness took home fourth place for his efforts. Farmer and Mindful followed Haness, opting for three height options and earning a second round overall score of 292, combined with a first round score of 268.5 for a total of 560.5, putting them in the temporary lead. The last three rides belonged to Farmer, but which one of her mounts would be the victor was still in question. Farmer entered again with It’s Me, co-owned with Bibby Farmer-Hill and Susan Pinney. They earned a second round score of 258 and a first round score of 275 to total 533, ultimately earning seventh place. Farmer followed her own round with Publicized, a new derby mount for the rider. They topped Farmer’s own score with Mindful to earn scores of 287 and 279, respectfully, for a total of 566, giving them the final second place prize. Saving the best for last, Farmer stepped in the ring to compete aboard Baltimore. In true champion fashion, they stepped up to the plate to garner the gelding’s first ever Derby win. They earned the highest combined two round score of 578 for the night’s win. Margie Engle and Abunola. Photos copyright Sportfot. Wellington, FL – March 17, 2016 – Week ten of the 2016 Winter Equestrian Festival (WEF) continued on Thursday with a win for Margie Engle (USA) and Elm Rock LLC’s Abunola in the $35,000 Ruby et Violette WEF Challenge Cup Round 10. Competing at the Palm Beach International Equestrian Center (PBIEC) in Wellington, FL, Engle and Abunola bested a field of 83 horses and riders, with Eric Lamaze (CAN) and Houston finishing second, and Lorcan Gallagher (IRL) aboard Venturo 9 placing third. Please note that the $130,000 Horseware Ireland Grand Prix CSI 3* has been moved to Saturday morning due to expected heavy rainfall in the evening. The grand prix will begin at 11 a.m. in the International Ring at PBIEC. WEF 10, sponsored by Horseware Ireland, features CSI 3* jumper and ‘AA” rated hunter competition running March 16-20, 2016. The week features the $35,000 Illustrated Properties 1.45m Classic on Friday, the $130,000 Horseware Ireland Grand Prix CSI 3* on Saturday, and the $35,000 Suncast® 1.50m Championship Jumper Classic on Sunday. The 12-week WEF circuit continues through April 3 offering more than $9 million in prize money. Michel Vaillancourt (CAN) set the course for 83 starters in Thursday’s WEF Challenge Cup, with 14 entries going clear to advance to the jump-off. Vaillancourt’s tiebreaking short course then yielded six double clear rounds. Engle and Abunola clocked the winning time of 41.68 seconds, sixth to go in the jump-off order. Eric Lamaze with Artisan Farms and Torrey Pines Stable’s Houston immediately followed in the second place time of 41.87 seconds. Lorcan Gallagher and Spy Coast Farm LLC’s Venturo 9 completed their round in 43.78 seconds to finish third. Danielle Torano (USA) and Callas III earned fourth place honors in a time of 43.94. Ilan Bluman (COL) and Blue Star Investments’ Ladriano Z placed fifth in 43.98 seconds, and Chris Surbey (CAN) and Linda Southern Heathcott’s Doremi finished sixth in a time of 50.97. Engle put together a partnership with Rich DeMartini and Lea Allen to purchase Abunola in September of 2015 and has been taking her time to get to know the horse over the last several months. She won her first class with the 11-year-old Dutch Warmblood mare (Numero Uno x Voltaire) in November competing in a $50,000 HITS Welcome Stake in Thermal, CA. She has since had consistent results competing in Wellington throughout the winter. “She is a lovely mare,” Engle detailed. “I watched her some last year and liked her. I was then fortunate enough to have Rich DeMartini help me put a partnership together to buy her, and they have been very patient as I have been getting to know her. Engle also appreciated the short course, noting, “I liked the jump-off when I walked the course, which was nice. She is very easy to accelerate, so you just kind of think it, and she is ready to go. I ride her in smaller spurs than any horse I have ever ridden. She was really good in the rollbacks. Rolling back on the liverpool, I was very pleased with her there, and also the rollback on the Rolex jump, the second to last jump. I was very happy with her. She has been very consistent here; we just needed a little bit of luck to go our way. Despite a case of mononucleosis, Engle battled through for a great win on Thursday. Always a fierce competitor, she was determined to compete and came out with a worthy result. Engle will now prepare Abunola to jump in Saturday’s $130,000 Horseware Ireland Grand Prix CSI 3*, which has been moved to the morning instead of being held at night under the lights due to expected rainfall. In addition to the winning prize money on Thursday, Engle picked up a $3,000 bonus for wearing SSG ‘Digital’ style riding gloves as part of the SSG Gloves ‘Go Clean for the Green’ promotion. Also competing in the International Ring on Thursday, Shane Sweetnam (IRL) and Main Road, owned by Sweet Oak Farm and Seabrook LLC, won the $8,000 Douglas Elliman 1.45m jump-off class. In the early morning fog, Kelley Farmer and So to Speak, owned by Glefke & Kensel LLC, won the High Performance Hunter championship. They placed first, third, and third over fences, won the stake jumping class, and were second in the under saddle. The reserve championship went to Autumn Rhythm, ridden by Sloane Coles for Nilani Trent. They won two over fences classes and placed third and fourth in the remaining two. In the under saddle, they were third. Farmer and her veteran partner So to Speak, a past USEF Horse of the Year winner, have been consistently winning at the Winter Equestrian Festival this winter. 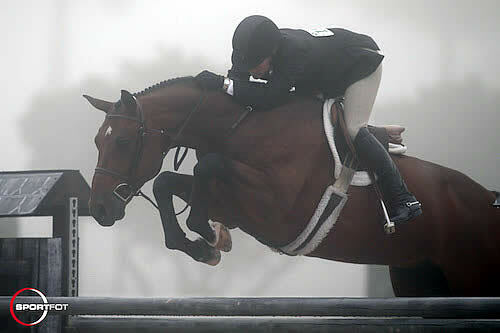 With his experience, the eight-year-old Dutch Warmblood gelding by Stakkato had no trouble with the foggy conditions. 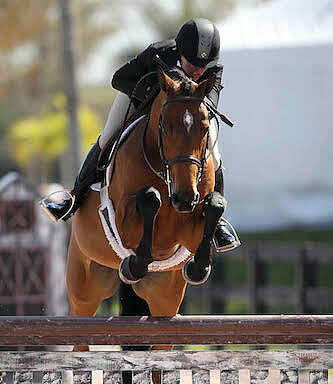 Farmer and So to Speak will be back in action at WEF during week 12 for the $50,000 USHJA International Hunter Derby. The tenth week of competition at the 2016 Winter Equestrian Festival continues on Friday with the $35,000 Illustrated Properties 1.45m Classic featured in the International Ring in the morning. The Ariat National Adult Medal will be the highlight class in the Rost Arena. For more information and full results, please visit www.pbiec.com. Rain or shine, the show must go on! Despite less than ideal weather conditions after four consecutive weeks of sunny skies, the $77,700 USHJA International Hunter Derby, presented by Brook Ledge Horse Transportation, took place in the Main Hunter Ring and saw 29 entries compete for the second largest international Hunter Derby purse offered in the country this year. The rain delayed the start but riders were able to relax in the Legend Lounge and enjoy a breakfast sponsored by Loretta Patterson and Accolade Farms. The cutoff score after the Classic Round was 160.5 set by Chances Are, owned by Artillery Lane, LLC and ridden by Gregory Prince of Sherborn, Massachusetts. Their Handy Score of 102 for a combined total of 262.5 would see them finish in twelfth place overall. Rebecca Patterson’s Vecchia Murano, ridden by Amanda Forte of Glenmoore, Pennsylvania, followed Prince after earning a first round score of 161. An overall second round score of 115 for a combined total of 276 saw them finish in eleventh place overall. Julia Curtis of Villa Rica, Georgia and her own Rocoso followed Forte in the Handy Round after earning a first round score of 166. Their second round score of 179 for a total of 345 saw the pair move into eighth place overall. Holly Shepherd of Grand Bay, Alabama in the irons of Barbar Risius’ Longstreet followed Curtis in the Handy Round order after earning a Classic Round score of 167.5. Their second round score of 177.5 for an overall score of 345 would have them finish in ninth place overall. Kelley Farmer had eight horses in yesterday’s Derby and had four return for the Handy Round. Farmer’s first ride was in the irons of her own Need I Say. “I bought him to be a Derby horse. He won two in Pensacola and was sixth in $100,000 in Ocala,” commented Farmer. “He’s a great pinch horse and can jump no matter what the conditions,” she said. “If I ride him earlier in the class I can always try something different with him that I might be able to use on my later rides,” she continued. “He has a tremendous amount of ability and is so nice to ride,” she added. The pair earned a second round score of 194 and combined with their Classic Round score of 169, their combined total of 363 would find them moving up to finish in sixth place overall. Farmer followed that round with Amanda Hone’s Publicized after earning a Classic Round score of 170.5. “Publicized is one of my greenest,” commented Farmer. “He’s a very fancy First Year horse and has only shown six times,” she said. “I was proud of him that he jumped the Derby and overcame the weather,” she added. Publicized and Farmer earned a Handy Round score of 132 for a total score of 302.5 and would finish in tenth place overall. Fleur De Lis Farms’ Bowie, ridden by Courtney Calcagnini of Bartonville, Texas, followed Farmer and Publicized after a first round score of 173. Their Handy Round score of 179 for a total of 352 would see them finish in seventh place overall. Tim Maddrix of Leeds, Alabama and Alina Dumitrescu’s Shutterbug earned a Classic Round score of 175. Their Handy Round score of 194 for a combined score of 369 saw the pair finish in fifth place overall. Farmer returned to the ring, this time in the irons of Kensel, LLC’s Mindful. Farmer and Mindful received a first round score of 177 and a Handy Round score of 198 for a combined score of 375. “Mindful is a fantastic horse. He has won fifteen Derbies and he won Ocala a week ago,” said Farmer. “He’s been Horse of the Year twice and there is nothing Mindful cannot do,” commented Farmer. “He’s a great horse and overcomes all situations,” she said. Mindful finished in third place overall. Jennifer Alfano of Buffalo, New York and her own Miramar followed Farmer and Mindful in the Handy Round after earning a Classic Round score of 178. Their second round score of 198 for a combined total of 376 would see them temporarily take the lead. Shepherd and Loretta Patterson’s Triompf followed Alfano in the Handy Round after earning a first round score of 180. Their second round score of 190 for a total of 370 would see then finish in fourth place overall. Farmer and Jane Gaston’s Baltimore were the final ride in the Handy Round. The pair earned a first round score of 182. Their Handy Round score of 205 for a combined total of 387 would earn them the win! “We are so excited about his win,” commented Farmer. “This is his first Derby win and only his second Derby ever. His first Derby had him finish second in Ocala,” she said. “Baltimore is one of my newest additions. I haven’t had him long but he is quickly fitting into our group,” she said. “I have to give a lot of credit to Bob [Bell] and his show management team,” Farmer continued. “They did their absolute best to put on a lovely class,” she said. “The weather was wet, but no one was slipping in the ring and we had a lot of water here,” she said. “For them to offer this large amount of prize money and invest in the hunters is a trend I hope more horse show managers follow,” she said. “I had a couple that handled the weather and footing better than others and that’s kind of a given and that’s why we have the amount and depth of horses we bring with us. There’s always one of them that is more suited to the conditions and ring than the others,” she said. “We were all really excited to ride on the grass grand prix field, but the weather prevented that from happening – there was nothing anyone could do about that,” she said. “We had a lot of rain here and given the conditions, the footing was fine. No one slipped in it. It was more a matter of some horses getting bogged down in the water because some horses are just more comfortable and deal with the different conditions better than others,” she said. “We have shown many places where the weather we had would have prevented us from showing at all. That was not the case here,” she added. “We haven’t shown on this circuit and are having a great time here,” Farmer continued. “Everyone here has been nothing but accommodating,” she said. “We appreciate the horse show putting up real prize money for the Hunter Derbies because these classes do a lot for the Hunter industry. We will continue to support these shows that invest in the hunters wherever they may be,” she said. “The only downfall I can see to this circuit is the great food they have around here,” Farmer laughed. “It’s so good I’m going to gain weight here,” she said. “I’ve been to The Half Shell, a barbecue place around the corner and they served us breakfast and lunch here at the show yesterday and pizza today. I’m sure I’m putting on the pounds,” she laughed. “We are proud to have produced the second largest International Hunter Derby purse in the country this year,” commented Bob Bell, President of the Gulf Coast Classic Company. “The weather was less than desired, but our team and the KCR footing we have in our rings allowed us to continue with the much anticipated $77,700 USHJA International Hunter Derby, presented by Brook Ledge Horse Transportation,” he said. “We appreciate KCR and Brook Ledge’s sponsorship of our shows and the great response we have received from the Hunter riders,” he added. “We look forward to continuing to offer large prize money Derbies next year and make the Gulf Coast Winter Classic the choice of top hunter riders around the country,” he added. For those who didn’t get to see the action live, click here to watch the livestream. For those looking to reserve stalls for the final week of the Gulf Coast Winter Classic, email jonathan@classiccompany.com and then go online to horseshowsonline.com and enter for no additional fees. All sponsorship and media inquiries should be directed to lisa@classiccompany.com.